Private M2/081977 Benjamin William Baron, Army Service Corps (Motor Transport) attached 1st New Zealand Ammunition Supply Park. Benjamin born on 12 February 1876 at 40 Temple Street, Bethnal Green, he was the eldest son of Benjamin Baron and his wife Caroline Jane (née Cooper). He was christened at St Judes, Bethnal Green on 5 March 1876. On 21 September 1902 Benjamin married Florence Maude Warren at the St John the Evangelist, Walworth, Southwick. At this time Benjamin was working as a coachman. However, he evidently saw that horse powered transport was not going to be the future; by 1911 he had moved over to the motor trade and was employed by the National Motor Cab Co in Hammersmith. By this time he and Florence had two children, Bessie (born 21 December 1906) and Benjamin (born 4 February 1909). A third child, Harold was born in 1913 at which time the family were still in west London (Fulham). 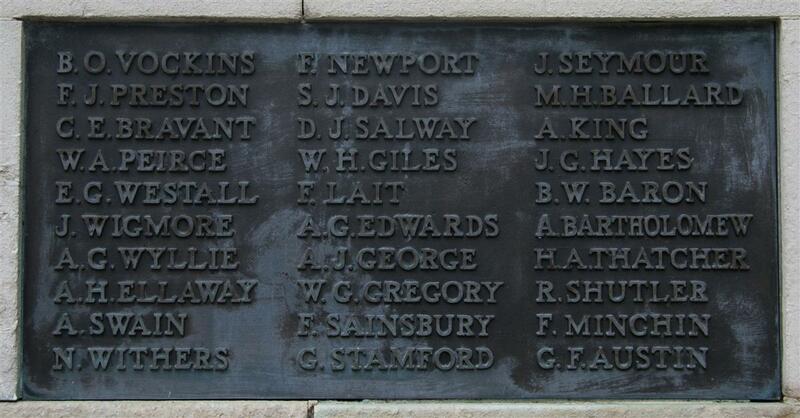 So far in his life there is nothing to suggest why Benjamin’s name should be on the Newbury Town War Memorial. However, when he enlisted, probably in mid-1915, he was a Newbury resident. Presumably he had moved out of London and found employment in Newbury. a more attractive image than driving a lorry down muddy tracks. Men like Benjamin, with experience of maintaining or driving motor vehicles, were desperately needed by the army and would usually be posted to the Army service Corps and their Motor Transport arm. Benjamin’s service number begins with M2 which indicates he was an mechanic/driver in the New Army (Kitchener’s army formed from the men who rushed to join the colours in 1914/5). It was not unusual for men with valuable skills to be sent to France with far less training that frontline soldiers, so Benjamin, who arrived in France on 28 August 1915 may have enlisted at any point between February and August. Benjamin found himself in France, attached to the 1st New Zealand Ammunition Supply Park. As the name suggests an Ammunition Park was responsible for the transport of all sorts of ammunition (artillery shells, grenades, bullets) to the New Zealand Division. This was vital and dangerous work, enemy artillery would target supply routes in attempts to starve the frontline troops or artillery units of supplies. As a mechanic Benjamin may well have been exposed to danger in order to help recover a broken down lorry, but, if he worked as a driver, danger would have been commonplace. He died on the 1 March 1918, in a period when the Division was not involved in any major activity, just the day to day trials and tribulations of manning a section of the allied line. They were responsible for a section of line east of Ypres (Ieper) to the north of the infamous Menin Road. Supplies had to be brought forward through dreadful conditions; perhaps through the road junction known as Hellfire Corner, well known to the German artillery and across the mud that made the Battle of Passchendaele such a nightmare a few months earlier. According to the publication Soldiers Who Died in the Great War, Benjamin was killed in action, implying that he died while carrying out his duty. He is buried in grave IV.A.13 at Ypres Reservoir Cemetery. Benjamin’s younger brother, John, also served his country and died in the Great War. Private 7921 John Baron was a regular soldier, serving with the 2nd Battalion of the Border Regiment when war broke out. He arrived in France on 5 October 1914 and died three weeks later on 26 October, during the First Battle of Ypres. Probably on Kruiseik Hill, where the 2 Borders lost most of two companies in a German attack that day - possibly only a mile or two from where Benjamin was to die in 1918. Thanks to Karen Newbery for her help researching this family.